Brendan Rodgers has warned the Scottish FA they will need to exercise patience if they are to successfully secure the services of Michael O’Neill. Celtic manager Rodgers feels his compatriot is capable of leading Scotland to the finals of both Euro 2020 and the 2022 World Cup if he decides to quit as Northern Ireland boss and accept the SFA’s offer to replace Gordon Strachan. But Rodgers is uncertain if O’Neill wants to remain in international football at a stage of his career when he could also be tempted by a return to the more regularly intense environment of a club job. The SFA made a formal approach to the Irish FA for O’Neill this week and it’s understood the 48-year-old wants the opportunity to speak to Hampden bosses about the vacancy. Even then, Rodgers does not expect O’Neill to be rushed into any decision. “It is a lot of thinking time for Michael just now and he deserves the respect to take his time and see where he is at,” said Rodgers. 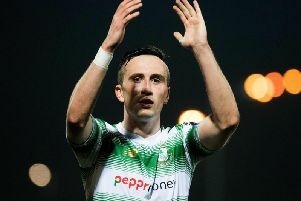 “It is not surprising that the SFA have made their move for him. There are a number of candidates who could do the job but it is about what Michael wants to do. “If you look at the Scotland squad right now, it is an exciting group of players there that could go forward. Michael has spent six years or so at Northern Ireland now, has done a European Championship finals and just missed out on a World Cup. Their top players over the next few years will move on. “Michael will be disappointed at missing out on the World Cup but if you look at Scotland, it is an exciting group and if he can pull them together and develop them then he would maybe have a chance of getting them to the their first tournament finals in 20-odd years and then maybe on to a World Cup after that. Rodgers is in fairly regular contact with O’Neill, most recently when he appraised him of the abilities of Millwall midfielder George Saville – a player the Celtic boss worked with at Reading and Chelsea – who performed well in Northern Ireland’s unfortunate play-off elimination against Switzerland. Should O’Neill become Scotland manager, he would have an ever closer relationship with Rodgers as Celtic currently supply more players than any other club to the national team. “Absolutely, and I want to help,” added Rodgers. “There is a real energy about the Celtic players when they go away with Scotland and there is a real core of them that can help. Michael has lived in Scotland for a number of years, he has played in Scotland and he knows what it’s like. “If he came out of Northern Ireland there’s nobody Northern Irish or anyone who would ever hold anything against him. Rodgers also believes Northern Ireland should look no further than Perth if they have to find a replacement for O’Neill. He sees St Johnstone manager Tommy Wright as the ideal fit for the job. “Tommy would be perfect for Northern Ireland if Michael moved on,” added Rodgers. “He’d be absolutely brilliant. He’s one who has earned his stripes at St Johnstone in terms of the work he has done there to make them competitive.